Magnets For Sale Strong Neodymium Magnets & More Right Here! We also realize here at Magnets For Sale that many of our clients do not purchase rare earth neodymium magnets or magnetic products every day. We also do not think you should need to pursue a PhD. in physics to make a decent decision on a super strong neodymium magnet purchase. The link below will help you (in about a 2 minute read) sort out all of these magnets for sale here at CMS. So if you think you want one of our strong large Rare earth magnets for sale, look through the magnet article and see if it fits what you need. If that doesn't work for you there is always our top notch customer service. Just call us we can guide you and fill your order right their on the phone. Neodymium Magnets & other Rare earth magnets For Sale At CMS & Magnets For Sale! A 60 second read can make you an educated magnet buyer without having to go out and get that PhD in Physics. 30 Piece Red Domino Magnets 2X1X0.45"
Disc Magnet Neodymium N52 2-1/2"x1/4"
This is what we do and all that we do. We sell magnets! Here at magnets For Sale & CMS Magnetics customers are our #1 priority and getting you the right magnet for your project just makes our day. We have a huge inventory on site centrally located in the country to get them shipped to you fast. We also realize that few people purchase magnets more than a few times in their lives. What that mean is unless you just happen to have a PhD in physics in your back pocket you may have a few questions about your magnets or where to buy rare earth magnets or where to buy neodymium magnets? Then there is the question what is the difference between rare earth & Neodymium. Magnets For Sale is a full service magnet store. Our 1st class customer service will answer all of your questions then take your order right over the phone if you wish or you can ask the questions & then go to Magnet4sale.com and order them there at your leisure. This is a rare earth super strong neodymium magnets and is made for holding stuff & that is what They do they do best! These are not the super strong neodymium magnets you played with as children 15-20 times the force of those old time super strong neodymium magnets. Never experienced Super powerful magnets neodymium? Now is the time! Our rare earth magnets have a high saturation magnetization & tetragonal crystalline structure ensuring top physical pulling force & maximum energy product from these strong magnets . These hold very well against steel surfaces with direct touch and direct pull. The magnetic strength will last forever under normal use. These powerful magnets neodymium are comprised of strong neodymium material makes them the strongest magnets of their size commercially available. They are axially magnetized so the north and south poles are on the flat surfaces, and the red line on one side of the magnet denotes which side the north pole is on. Neodymium magnets are strong magnets & are unique because of their extreme resistance to demagnetization and will only lose their magnetism if they're heated above 176 degrees Fahrenheit. CMS Magnetics is an established supplier of premium quality super strong neodymium magnets that are used in some of the most demanding and critical applications such as aviation, automation, and manufacturing systems that help shape the world around you. Because we strive to only supply the highest quality super strong neodymium magnets, our super strong neodymium magnets are all produced in state of the art facilities that ensure a high standard of both quality and performance are met. We have a fast moving inventory right here in Texas and more coming in from our manufacturers everyday. What this means is if you order 5 magnets to see if they will work in your large project and they do work, you can get 500 or 1000 or 10000 more the next day. Magnets for sale at Magnets For Sale is a clear statement of the obvious. We here at Magnets For Sale do indeed have thousands of Neodymium magnets (N35,N40,N45, N52 & more), Samarium Cobalt magnets, Ceramic magnets & AlNiCo magnets for sale. All shapes, Magnetic strengths, sizes, magnetic materials, & types of magnets are available for immediate fast shipping anywhere. We at Magnets For Sale pride ourselves for providing 1st class customer help in selecting and ordering magnets with our chat service or just call us if you need help determining which magnets fit your magnetic needs then order them right over the phone. Retail, Wholesale & Bulk Magnets for sale. At Magnets For Sale & CMS Magnetics we realize that most people do not order magnets all of the time and having to learn the lingo and all of the information that goes along with that is too much information for most people when this is a few times in a lifetime exercise. So do not hesitate to call and by the way call by 2 PM & get it shipped today. Come back often for great deals on overstocked items, last years models & wholesale blowout sales. At Magnets For Sale we supply thousands of top-quality formats & Grades. N35, N42, N45, N50 & N52 grade strong Neodymium magnets were mainly for scientific, technical and industrial use in the past, but these super strong magnets up to and including the super strong N52 neodymium magnets have seen a tremendous price drop as manufacturers compete, making them easily affordable for the hobbyist & the Industrialist. We Sell Wholesale, Retail & Bulk domestic sales as well as magnet sale overseas. Super strong Neodymium magnets at their strongest. Retail, Wholesale & Bulk Magnets for sale. Your complete magnet supplier. 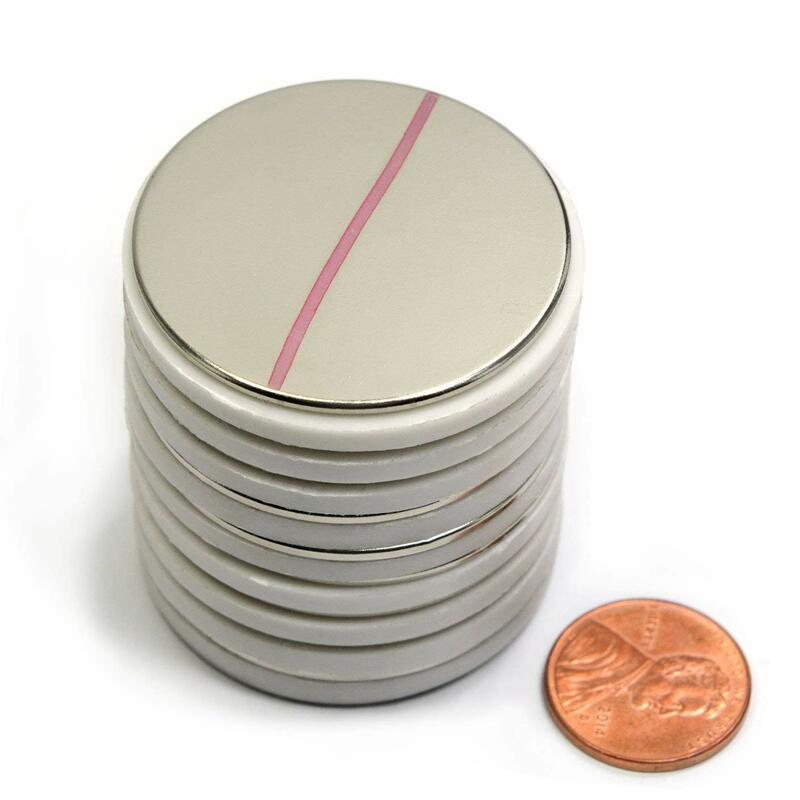 The top 2 grades of strong neodymium magnets N50 & N52 are here at magnets For Sale & CMS. There are no stronger permanent magnets on the face of the earth than the super strong N52 neodymium magnets. Super strong too are the N50 Neodymium magnets but we realize that not all projects require the super powerful magnets that N52 grade magnets are. N50 Neodymium is slightly less strong than the N52. When it comes to magnetic strength this is where they are here at Magnets For Sale & CMS. Due to their super high strength and low cost, these super strong neodymium magnets revolutionized magnetic products. These magnets are the strongest developed thus far. Because neodymium magnets are between seven and fourteen times stronger than ceramic magnets they are sometimes called super strong or super powerful magnets. Magnets For Sale & CMS magnetics sells the strongest type of neodymium rare earth permanent magnets on the market on Magnet4Sale.com with a grade range of N35 to N52. The super strong grade N52 the strongest neodymium disc magnets are the most powerful magnets so far and a strong grade N52 magnet measuring only ½” can have a pull force of 32 lbs.! Our shop carries a variety of these powerful magnets for sale to fit many different applications. Strong Neodymium magnets can be fabricated into many shapes and types:Strong Disc Magnets, strong Block Magnets, strong Ring Magnets, strong Cube Magnets, strong Sphere Magnets, Wedge magnets, Arc Magnets, Countersunk, and the strongest Adhesive Magnets. At Magnets For Sale / Magnet4Sale.com , we also sell strong custom neodymium magnets and strong custom magnetic assemblies so we can help you find the best fit for your project specifications. Today, no matter where you go, you can always find strong neodymium magnets in action. In your home, refrigerator magnets, ear buds, jewelry cases and cell phones use this powerful magnet as a tool. Magnets are found in iPads, high end speaker systems, toys and hybrid cars. Neodymium magnets are extensively employed in big industry applications as well. From magnetic separators, lifters, sweepers and fishing systems to switches, precision-guided missiles and wind turbines. Since their invention in 1982, neodymium magnets are rapidly replacing the old and weak technology of ceramic magnets and incorporating their use into daily life. See Magnets For Sale & CMS Magnetics for the strongest Neodymium magnets there are ...Bar None! Further reading concerning the history of all of the rare earth elements and more specifically Neodymium & Samarium. The discovery of rare earth elements started in 1787 when Swedish Army Lieutenant Karl Axel Arrhenius collected the black mineral ytterbite (laterre named gadolinite) from a feldspar and quartz mine near the village of Ytterby, Sweden. Although rare-earth bearing minerals were collected prior to this time, none were identified as containing a new "rare" and different "earth" (a historical term for an oxide) until B.R. Geijer of the Royal Mint of Sweden, forwarded the Arrhenius sample to Finland for analysis. Separation of the first impure rare-earth oxide from ytterbite occurred in 1794 when Finnish chemist Johan Gadolin (University of Abo) made an impure yttrium marking the beginning of a scientific saga that was to extend over a century and a half to separate, identify, and produce pure compounds and metals. In 1797, in honor of Johann Gadolinâ€™s discovery, A.G. Ekeberg of Uppsala, Finland, proposed the name gadolinite for the mineral and yttria for the "new earth"
What is Rare Earth & What are Rare Earth Elements Used For? The rare earth elements are not really rare and actually are a fairly abundant group of 17 elements comprising 15 elements of the lanthanide family and both, scandium, and yttrium. The elements range in abundance from cerium, the 25th most abundant to lutetium and thulium, the least abundant elements. The lanthanide family of elements are a collection of 15 elements whose atomic weights run 57 through 7. The elements in the lanthanide family include : lanthanum (La), cerium (Ce), praseodymium (Pr), neodymium (Nd), promethium (Pm), samarium (Sm), europium (Eu), gadolinium (Gd), terbium (Tb), dysprosium (Dy), holmium (Ho), erbium (Er), thulium (Tm), ytterbium (Yb), and lutetium (Lu). The 2 elements highlighted above are the primary elements that are used in the magnetics industry as Neodymium magnets and Samarium Cobalt Magnets.. The rare earth elements can be placed into two groups depending on the electron configuration of their atoms. The two groups are the LREE (Light Group Rare Earth Elements) and the HREE (Heavy Group Rare Earth Elements). The differences in configuration of the electrons are significant to the individual properties that the rare earth elements exhibit and how they interact with other elements and compounds. The table below shows the elements in their groupings as defined and used by the U.S. Government’s U.S. Department of the Interior-U.S & Geological Survey. As you move through the modern world in your daily lives rare-earth elements are present at every turn. Whenever you ride in a car or bus the gasoline or diesel fuel is produced with lanthanum-rich fluid cracking catalysts, cerium is used in the catalytic converter, and an yttrium-zirconium oxide ceramic monitors the oxygen/fuel mixture. Neodymium magnets are components in the ABS brake systems, cruise controls, car stereo systems, speedometers and gauges, and in tiny electric motors controlling the door locks, power windows, heater/air conditioner fans, electric mirrors, windshield wipers, fuel pumps, and starter motors. Your ability to access your checking account balance is possible with the help of the rare earth elements. Super Strong Neodymium magnets have been available since the 1970s. Neodymium magnets come in all shapes and sizes, including wheels, rods, squares, rectangles, cubes and rings and many others that are available at Magnet For Sale & CMS Magnetics. At Magnets For Sale we supply thousands of top-quality formats & Grades. N35, N42, N45, N50 & N52 grade Neodymium magnets were mainly for scientific, technical and industrial use in the past, but these super strong magnets up to and including the super powerful N52 neodymium magnets have seen a tremendous price drop as manufacturers compete, making them easily affordable for the hobbyist & the Industrialist. Neodymium disc magnets are by far the most popular type of "round" magnets and include uses such as closures for product literature binders and art portfolios to bulletin board "thumbtacks". For simplicity, we have divided these into small disc magnets which range from 2.5 to 12.5mm in diameter (1/10 to 1/2") and the stronger large disc magnets which cover 15-25 mm in size (3/5 to 1"). Dimensions are specified as "diameter-thickness". Rare earth rod or cylinder magnets are a subset of round magnets that are differentiated in having their height greater than or equal to their diameter and are specified as "diameter-height". The taller versions of this style are very handy for use as super strong magnet stud finders and nail locators. Ring rare earth magnets are, as one might imagine, the disc magnets with a hole in the center. Its dimensions are listed as "outside diameter, inside diameter thick." Try to mount a lot of them in a pencil a simple demonstration of levitation. Neodymium cube magnets by definition, all three sides of the cube are of equal length. 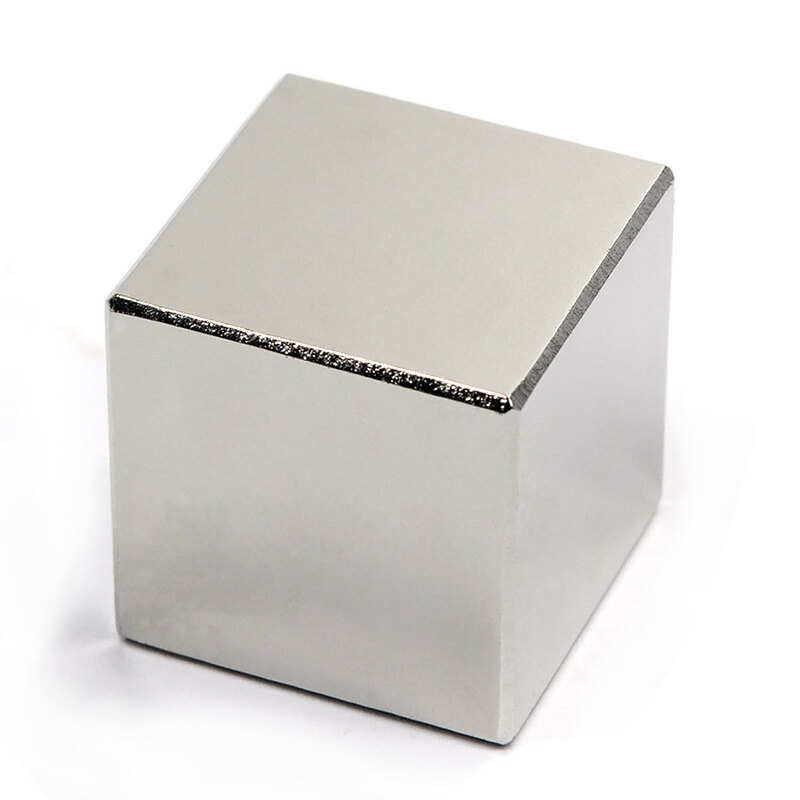 Neodymium magnet squares have equal sides and thickness dimensions are considered undesirable side where the sides are of equal length. Applications include use in brushless motors, bicycle speedometers and fly fishing reels. The super strong NdFeB magnets have a higher Maximum Energy Product, typically stated as (BH)max, than Sm-Co magnets. (BH)max of NdFeB can easily reach 30 MGOe and even goes up to the super strong 52 MGOe. NdFeB magnets can replace SmCo magnets in most cases, especially where operating temperature are less than 176 degrees Fahrenheit. The temperature stability of NdFeB is not as good as SmCo magnets. Magnetic performance of NdFeB magnets will deteriorate rapidly above about 176 degrees Fahrenheit. Compared to SmCo magnets, the corrosion and oxidation resistance of NdFeB is relatively low. Sintered NdFeB permanent magnets are made with several steps. At first, a NdFeB alloy is formulated based on upon the desired properties of the final neodymium magnet product that it’s supposed to reach. The alloy is produced in a vacuum furnace and then crushed into a powder form. Sintered NdFeB permanent magnets are formed by powder metallurgical process. These magnets can be die pressed or isostatically pressed. During the pressing process, magnetic fields are applied with the assistance of specially designed processes that align the magnetic "domains" of the material and optimize the magnetic performance of these super strong magnets. The pressed magnets are then placed into a furnace under special atmospheric conditions that are conducive for achieving the desired result of a strong magnet. After sintering, the shape of the magnet is rough and barely resembles the appearance of the finished product, and need to be machined and ground into shape to achieve desired shape and size. A surface coating is usually applied on NdFeB magnets, with Zinc or a triple layer nickel-copper-nickel coating commonly used as protectives layers. Other materials such as cadmium chromate, aluminum chromate, tin or polymer (epoxy) are also used for this purpose. Both NdFeB and SmCo magnets can be made either in sintered or polymer-bonded magnets. The polymer (such as epoxy)-bonded magnets can be produced with close tolerances off tool, with little or no finishing required. Sintered magnets usually require some finishing operations in order to hold close mechanical tolerances. Sintered magnets however typically are much stronger and are more durable than bonded magnets and are the ideal choice for people who need strong magnets. Grade Br(KGs) Hc(KOe) Hci(KOe) (BH)max(MGOe) Density(g/cm³) RecoilPerm. Temp. Coeff.of Br (%/°C). At Magnets For Sale & CMS Magnetics we sell the actual neodymium, samarium and other types of magnets but we believe that it is also valuable to schools and actually all learners that a deeper education concerning our products and their backgrounds is important in that it may spawn an interest in children to move into areas of science such as Physics or Chemistry as a profession. Neodymium magnet (also known as NdFeB) is the type of permanent magnet most widely used in various industrial and household products due to its (1) large magnetic strength, (2) high resistance to demagnetization, and (3) relatively cheap price. Though it is discovered in 1984, later than most of other types of permanent magnets, neodymium magnet is replacing alnico and ceramic magnets in many applications. Neodymium is a rare earth metal and neodymium magnet is an alloy composed of neodymium, iron and boron atoms that are organized in a microcrystalline structure with a chemical formula of Nd2Fe14B. Because of the low temperature (-254.2/-425.5 ºC/ºF) at which the ferromagnetism of neodymium metal disappears (or called Curie temperature), a certain amount of iron is present in neodymium magnet in order to increase the Curie temperature well above room temperature. Neodymium magnets are manufactured in the form of powered porous metal in which the irons are more easily subjected to oxidation or rust, especially under humid conditions, though recently certain grades of Neodymium magnets have been made that exhibit higher resistance to oxidation. Corrosion can be at least partly prevented by applying a suitable coating or plating. Neodymium Magnets can be coated by many different materials including nickel, copper, zinc, tin, epoxy, silver and gold, though nickel is the most commonly used one and a multi-layer coating method (e.g. nickel-copper-nickel) is also usually applied to make the product more resistant to corrosion. The performance of a coating or plating could be evaluated with a Salt Spray/Salt Fog Test (SST) and this is executed in accordance with ASTM B117.